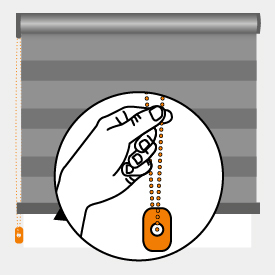 When ordering roller shades, the fabric will always be made at least 1 3/8” narrower than the width ordered. Inside mount means the window coverings will be mounted and hung on the inside of the window frame. Not recommended for shallow windowsills. 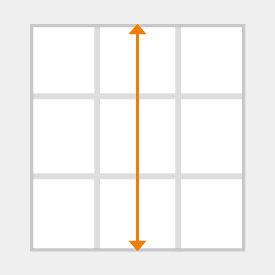 Outside mount means the window coverings will be mounted and hung outside of the window frame or on the ceiling, making it ideal for shallow windowsills or for more complete light blockage by reducing the halo effect. 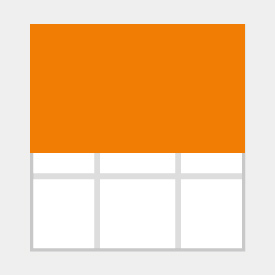 Add a one channel remote or upgrade to a 6 or 16 channel remote to operate multiple shades with one device. Please select no-remote for the other shades when upgrading the remote. Trendsetter alert! Up the ‘cool’ factor with this multi-functional window treatment. 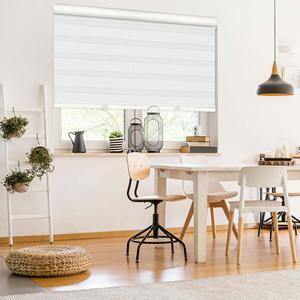 Our Premium Flat Rollers combine the look of a traditional horizontal blind with the smooth, streamlined appearance and operation of a classic spring-loaded roller shade. 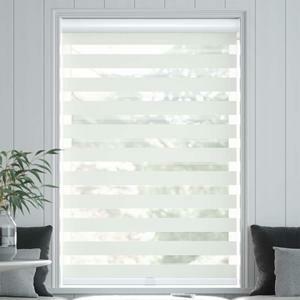 Blending panels of both solid and sheer fabric into one creates a unique, custom design option, with the translucent and solid bands forming an awesome zebra effect when open. Here’s how they work. Premium Flat Rollers are made up of two separate layers of fabric, both paneled with bands of solid and sheer fabric. 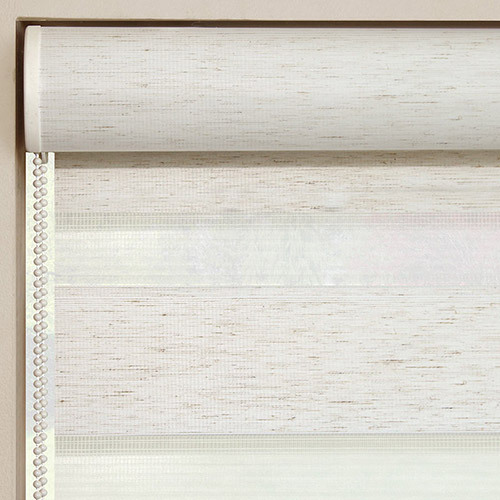 When the fabric and sheer bands are aligned and open, the sheer, light-filtering material lets you see out and lets light in, just like other horizontal-style window treatments. 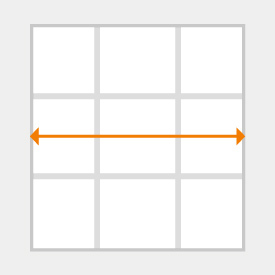 Simply rotate the bands to close them, and voila! The solid panels fill the entire shade, making it look like a regular roller. Easily roll these beautiful products up and down with your choice of a standard continuous cord loop, or upgrade to a cordless lift. Trendy buyers are also opting to customize with the available remote controlled motorized lift system. 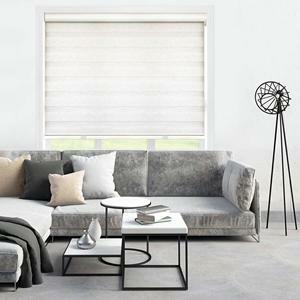 The best solution for hard to reach and extra large windows, you can power multiple coverings throughout your home and program them individually from a single remote with the touch of a button. 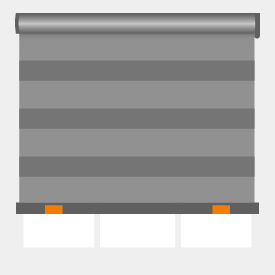 Because of the design of this window treatment, no extra fabric is added to roller. Product can only be mounted to the top or rear of window casing. Side mounts not available. Outside mount: Fabric will be 1-1/8" less than ordered width. Inside mount: Fabric will be 1-3/8" less than ordered width. 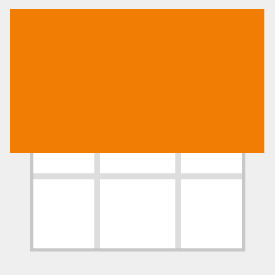 We recommend ordering the same lift system for shades going in the same room. Cordless cassette/head - and bottom rails available in white only. Standard continuous cord loop cassette/head - and bottom rails and chain will be ivory on lighter color products and light brown on darker colors. 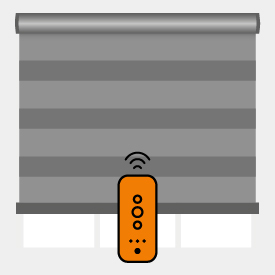 Motorization remote is not included and at least one remote is needed per order. Motorization charger comes standard. Add a 1-channel remote which can operate on a single frequency or upgrade to a 6-channel and 16-channel remote available at additional cost. When upgrading to multi-channel/frequency remote, please select 'No Remote' for any additional motorized shades you want to add to and power with it. Battery operated white remote comes included with a lithium battery CR 2032 – 3v. Remote reaches from approximately 260 feet away from shade. purchased 3 for a bay window for our beach house dining area-they look custom and sleek and it has changed the entire look of the room Even looks great from the outside! I happened to call in and get a rep that had just been trained on this product and she was able to answer all my questions. The web site does not do it justice. These blinds are absolutely beautiful!! Love the look of these blinds...VERY unique. Enjoy the variety of looks. Not sure why they are referred to as room darkening in the product description though. They filter the light nicely, but certainly don't darken, at least by my understanding of the term. Overall, highly satisfied! We just opened a new fitness studio and needed soft looking shades, but fuctional as well. We had 4 very large windows to cover and I was a little unsure about ordering from an internet site and making my own measurements. But it was all so easy and the shades were exactly what I was looking for! I'm very happy with the price and the quality!